Your guide will meet you up in the morning at your hotel by car and together you’ll reach an area that will be propice to cross country skiing. The drive will take a maximum of 45 minutes. The route is not pre-defined and the guide will decide in the morning the destination depending on the snow conditions. Once we arrive at destination, the guide will give you a pair of nordic skis and poles, a pair of boots, and a bag pack if needed. 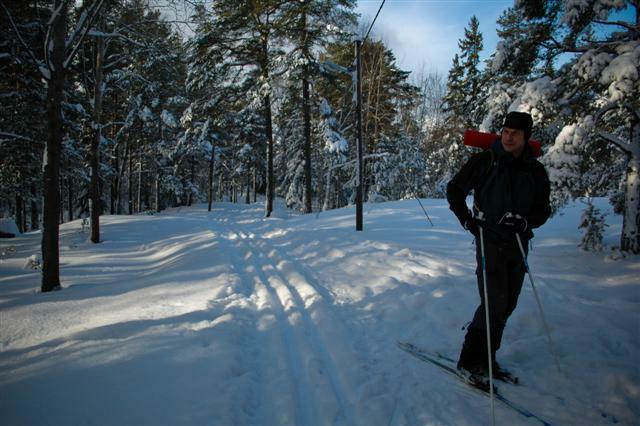 Do not forget to dress properly for the physical activity that is cross-country skiing, i.e. several layers (tee shirt wool or synthetic, fleece or wool sweater (avoid cotton), and waterproof jacket / windbreaker), as well as hat and gloves. We will probably start the hike on a track more or less prepared for cross-country skiing, but quickly enough we will make our own track through the forest. If the lakes are frozen, we can also ski on them! We will stop for a tea and cookie when we feel hungry. A little later we will stop in the forest or at the edge of a lake, we will light a wood fire that will keep us hot and enjoy a good organic vegetarian meal. As the sun goes down around 15h in the winter months, we will be on the skis until around that time. And you will see, that will be enough, the practice of nordic skiing is quite physical. You will be back at your hotel in Stockholm around 4pm.